‘The First Cut Is The Deepest’…. It’s been nearly two weeks since my last little entry. It doesn’t seem like I’ve a lot to show for the time since. Last week was March Break hereabouts and, although I didn’t have a break, I had great plans for getting lots done while I didn’t have to run the boys back and forth to the college. However, ‘the best laid plans….’ and all. I ended up coughing my lungs up for the better part of the week and feeling less than well. However, the week wasn’t a total loss. I started out Monday by cleaning out my little woodshop up at the other house to make room to try and construct this little ‘not-so-common hand press’ that I’ve been drawing plans for. 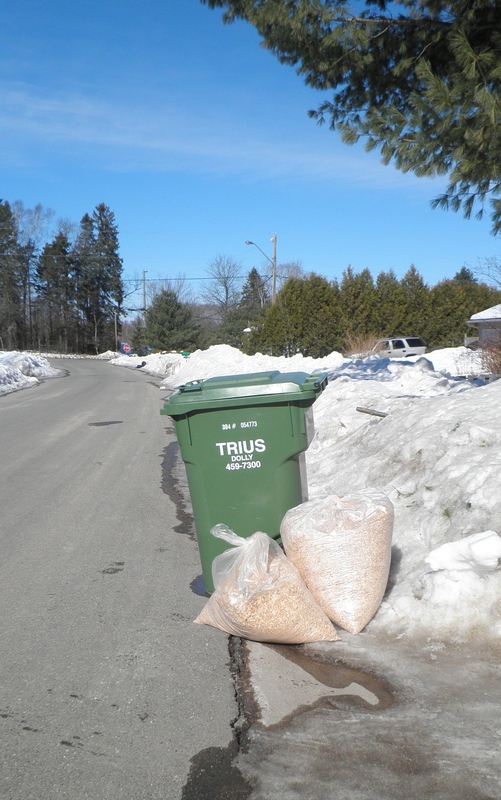 By Tuesday noon, I had things pretty much organized (to a point) and half a dozen large bags of shavings and (s)crap hauled off to the dump. A trip to the dump is always very lightening and freeing, I find. 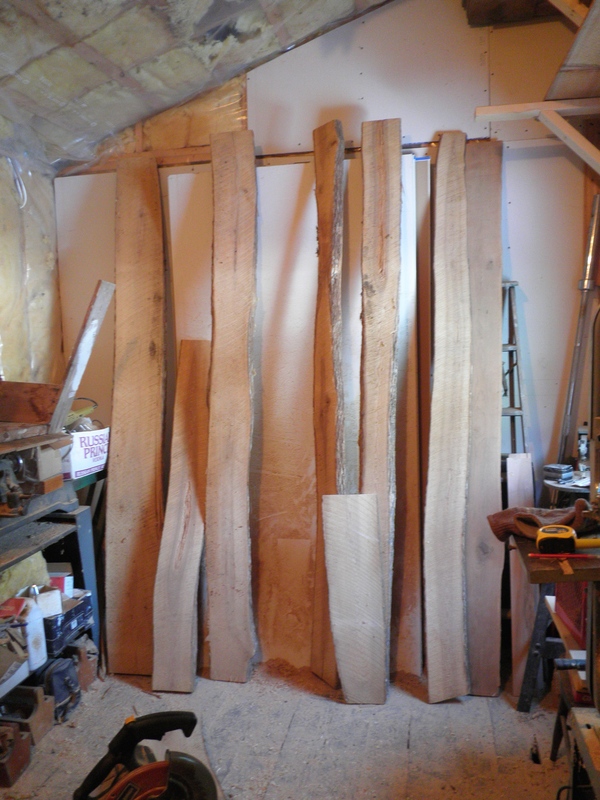 Anyway, the next step, which was really the first step, was to get my little stash of rough sawn ash down from the shelf brackets up high on one wall. A job for both the oldest young lad and myself. A dirty job, too, what with the squirrel nests and squirrel crap and filth laying on top of it all. Probably enough of that Hantavirus to kill off half the population. Anyway, it’s been a week and neither of us seems to be adversely affected(knock on wood). We got the wood down, though. 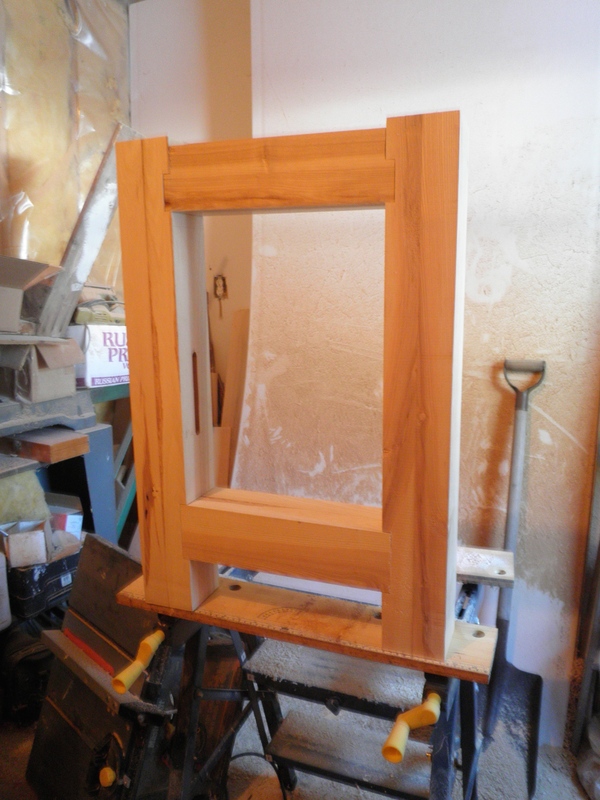 Here is a shot of it…..
Now I’ve been saving this ash for something special. I acquired it from and old guy who had been holding onto it for over thirty years. He, too, had been waiting to do something special with it but never had. I thought about not using it for this, but remembered him and decided I might not live long enough for something ‘special’ enough to come along. So, time to use it and make this something special. That being said, it took more time than it should to figure out exactly what I had and the best way to use it without wasting any and maybe having some left for some other special project. 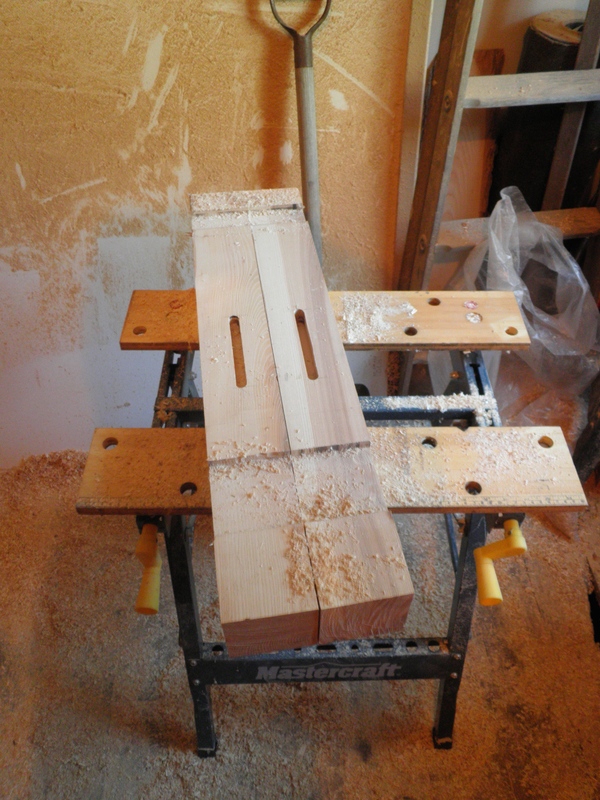 As I said, the planks of several thicknesses were rough and first had to be planed to see what was what and how thick they were going to end up being. 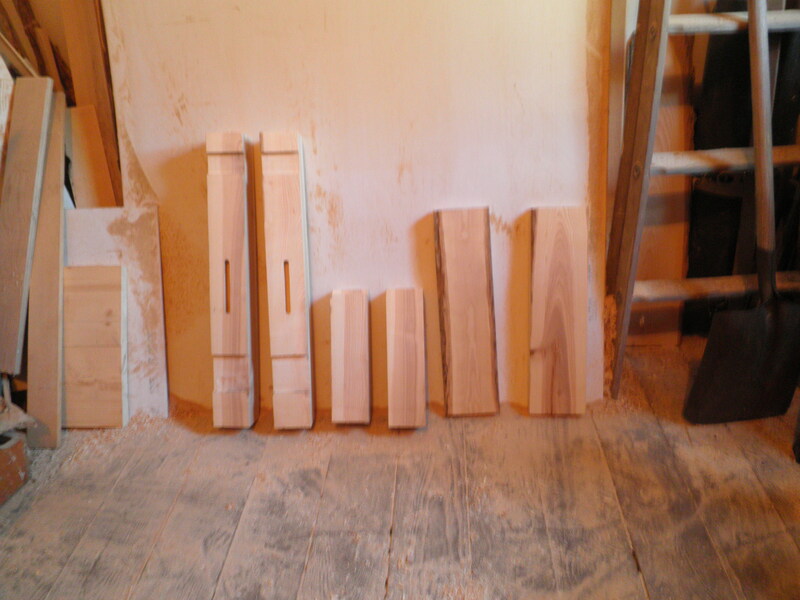 It took me the rest of the week to get things at least roughly cut, planed and, where necessary, glued up. 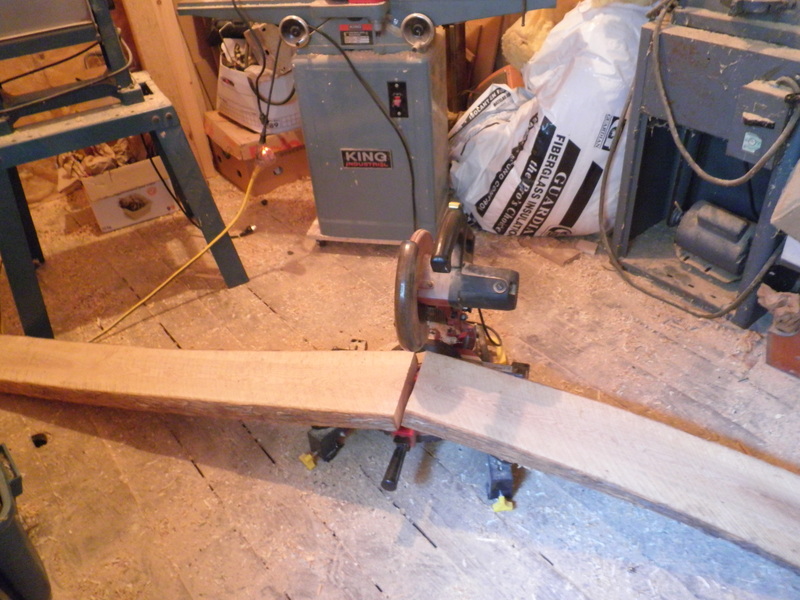 Here’s a pic of the first cut — a heavy one, and in keeping with Keith Hampshire’s song from way back, ‘The First Cut Is The Deepest’…..
Glueing up of stock had to be done in the house with lots of time being allowed for the wood to warm up which brings me to one of the biggest obstacles of last week. Every morning was about -20 Celsius and the little industrial heater in the shop could barely take the edge off what with the cute but damnable little squirrels having torn out a lot of the insulation and ripped the vapour barrier. But, by the time it came to leave each morning, it was getting workable. The afternoons were a little better.